The Virtual Paintout - Croatia! 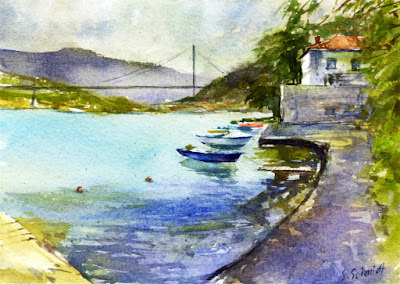 The Virtual Paintout for October 2012 was in Croatia! 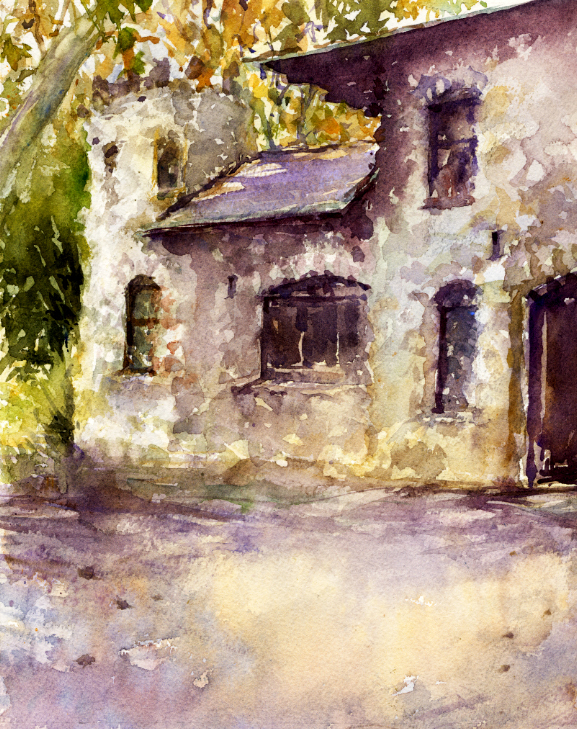 Bill Guffey created The Virtual Paintout and assigns the monthly location for our paintings. This was my third time to participate. 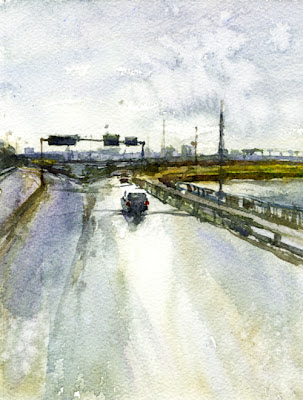 Artists must use Google Street View to look around the specified city or country to find their images to draw or paint. The URL of the street view must be submitted to Bill along with our artwork. I really loved the variety of gorgeous scenery in Croatia. It looks like a beautiful place for a real life visit. I had to report for jury duty on October 1 which always entails a lot of waiting. I was happy to see that the computers in the juror's room could get Google Street View! Since I had a lot of time to wait, I took the opportunity to "look" around Dubrovnik, where there are some beautiful, sheltered marinas. I felt like trying another piece with water and found several possibilities for painting reference. Master watercolorist Joseph Zbukvic grew up in Croatia in a farming area and mentioned in one of his DVDs that he still loves those scenes. For my second piece I looked around rural areas outside of Zagreb for a farm or rustic buildings, hoping for the same inspiration. It turns out that there are hundreds and hundreds of farms and ranches there. When the end of the month nears I have to make a decision on what to paint! For these two pieces I wanted to try using gouache, opaque watercolor. I really had fun using it for landscapes. These are both about 5"x7". The Castle Green Hotel is one of the oldest historical landmarks still standing in Los Angeles County. 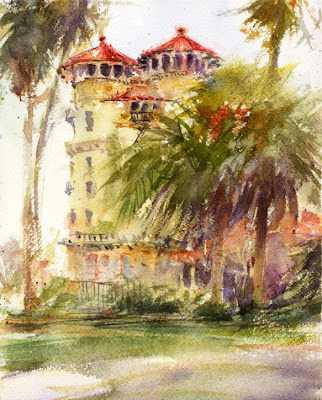 Incredibly, by 1900 Pasadena, CA had 14 resort hotels and Castle Green (1887) is the last of the earlier resorts, and was one of the most popular. Today the elegant hotel is divided up into condos. Much of the original building connected to the old hotel is gone due to fire and earthquakes. The two stunning 7 story cylindrical towers are still there for us artists to paint. Happily, Central Park with lovely palms and roses is across the street so we can get a great view of the hotel. 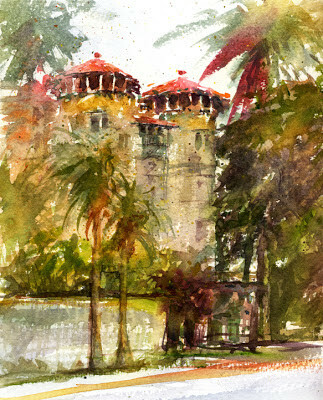 It turned out that both of the plein air groups I go on paint-outs with were meeting at Castle Green in the same week! OK, I would find plenty to paint. The weather wasn't so cooperative. On Thursday as I drove to the park, it was sprinkling. The drizzle stopped but there wasn't any sun to paint that day. Then on Saturday it was even more drizzle-y and didn't really stop. My painting friends were going to stay and paint so I did as well. I found a tree to paint under and changed my view from the one I painted on Thursday. I like to let my first wash dry before continuing but it just wasn't going to happen that day. I was also trying some new watercolor paper which seemed kind of "soft" to me so that was a challenge too. I tried to continue with "dry brush" but I had to finish that piece at home. So, here are my two watercolors of the Castle Green and the two photos of my views. Always fun whatever the weather! A recent plein air paint out was at the Pasadena Playhouse, a 1925 Spanish style theater with a lovely courtyard and fountain. 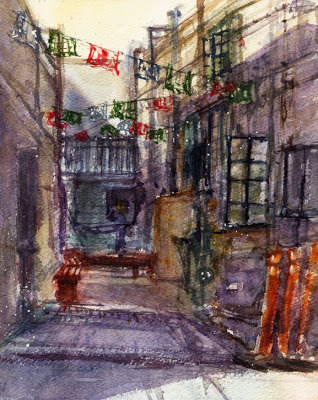 When I arrived, the Friends of the Playhouse ladies were setting up in the courtyard for their fund raising bazaar. I didn't see a spot to paint where I would be out of their way so I walked up the street a ways. There was a pretty, neat walkway next to the Zona Rosa coffee house. It had benches, plants, and decorations as well as a city bench across the sidewalk for a nice view so I decided to try it. I especially liked the Mexican cut-paper decorations, papel picado, which were hung like tissue paper banners, zig-zagging overhead the length of the walkway. This walkway space is the location of a fun Dia de Los Muertos, Day of the Dead, event with fabulous paper mache skeletons and flowers at the entrance. The day I was there the papel picado decorations were red, white, and green for Mexican Independence Day, September 16. Since it was morning, the light and shadow in the walkway between the buildings was dramatic. I tried to capture it. I would like to try this view again to see if I can get the light and shadow better. The papel picados perk it up nicely. I'll try painting at the Pasadena Playhouse another day! 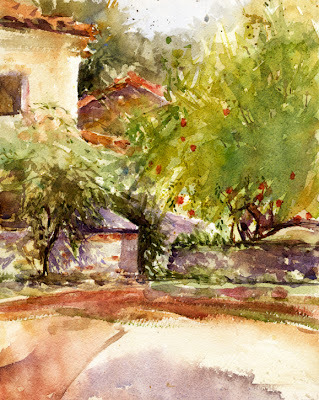 The plein air painting group met at the Old Mill in San Marino, CA again. It was really a mill, the grist mill for the San Gabriel Mission, built in 1816. It was featured in my blog post in September titled "The Old Mill". 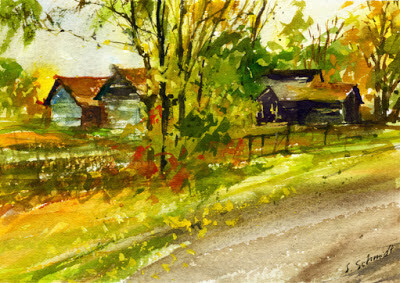 The predicted rain was delayed so we painters had a nice but overcast morning to paint at the mill. One of the features of the property is the Pomegranate Patio. In September I mentioned that the pomegranates weren't red and ripe yet. Now in October, the ones in the sun look beautiful, but there is still some paler fruit on the shadier, north sides of the trees. A few of the pomegranates were ripe enough to split open. Several artists were drawing and painting the gorgeous lower fruit but I still felt like trying a wider view. Here is my painting (8"x10"), photo of my view, and a photo of the beautiful fruit on the trees. 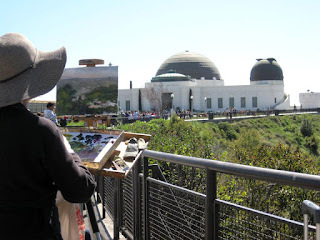 On one of my early plein air paint-outs with the group we met at Griffith Observatory (opened in 1935) in Griffith Park, Los Angeles, CA. 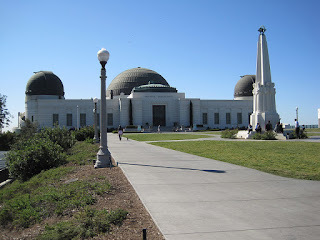 We meet early in the day and the Observatory doesn't open until noon so I thought we would be about the only people there. Wrong! Besides lots of hikers, dog walkers, deliveries, and the school busses of kids, there were several television news crews doing live reports. It turned out to be the height of the March solar storms. Since they can disrupt technology on Earth, the news crews were there to report on possible power and GPS outages, and airline flight rerouting. I stayed out of the reporters' way and set up where there was a nice view to try for my watercolor. I'm posting my painting (9"x12" with a narrow border), and a photo of my view. 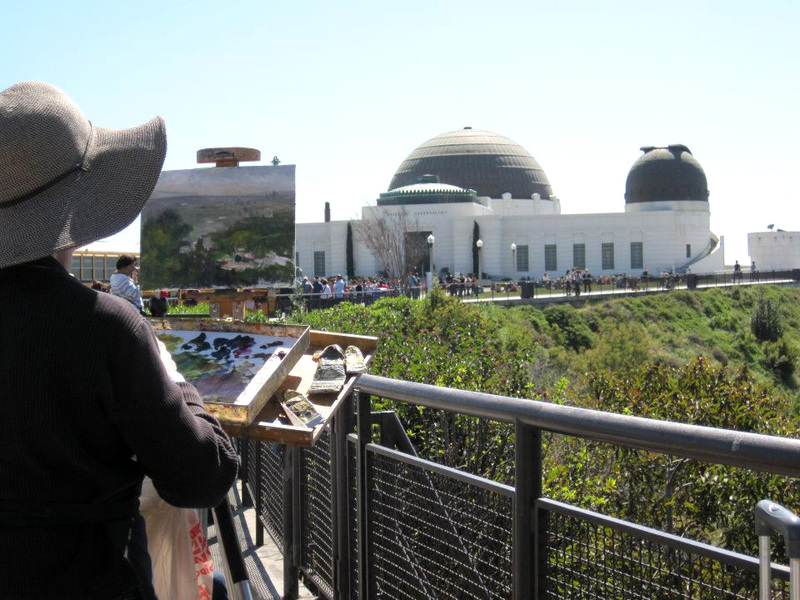 I also got a nice shot of a fellow painter just finishing up her oil of the hillside and rooftops. And I'm thrilled about the last photo treat which you'll have to read about below! I'm so happy Aaron Kiely gave me permission to post his photo here! 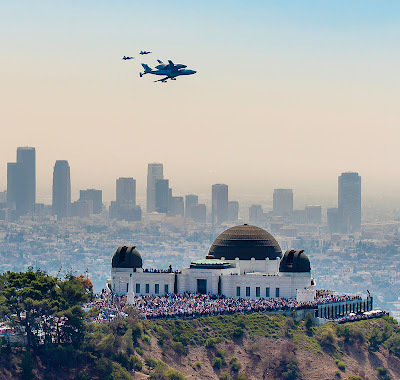 It is by far my favorite of the hundreds of shots I saw of the space shuttle Endeavour's final flight over Los Angeles landmarks on September 21, 2012. What a gorgeous and dramatic photo of the planes! 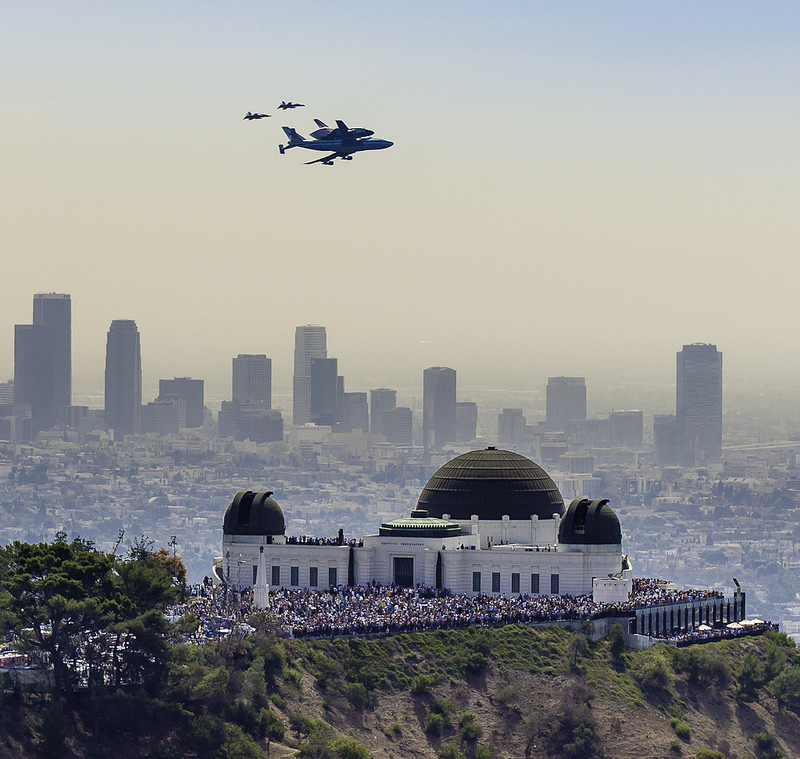 The sharp Observatory in the foreground with the crowds, and hazy downtown Los Angeles in the distance...Love it. It's by far the most fun store to visit and shop at in South Pasadena. 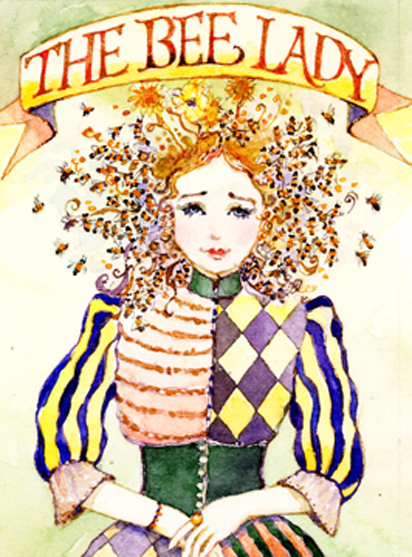 Its owner is wonderful and creative, and she has artistic, amazing employees who contribute so much. I've taken a couple of inspiring, crafty, classes there. They also have a store cat named Alley! I had been planning to do a blog post about this terrific store. I mentioned it in my post "The 350 Project". Today I received an email from Zinnia announcing that they are moving to a different location which isn't such happy news to me. I hope their new location will not be too far away. Well, what an opportune day to finally get to that blog post! Zinnia is a special store because they also have a small gallery space where they've hosted some really wonderful and popular shows. I've participated in each one since I wanted to support them all I could. I'll post the pieces I've painted for their shows here. 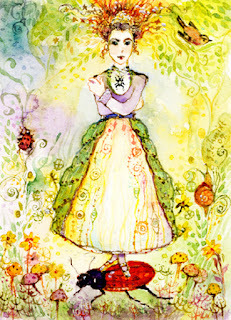 All are ACEOs or ATCs which are always 2 1/2" x 3 1/2" and can be in any medium. These shows were when I was illustrating commercial greeting cards so I tried to have fun with my pieces for Zinnia. The first show was in 2008, The Bee Cause: a Group Show Dedicated to the Honey Bee. 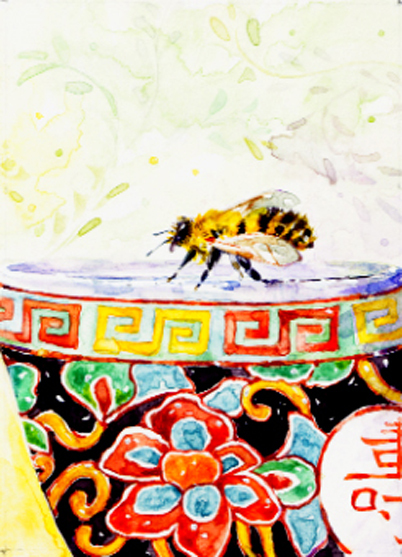 It was a benefit to bring attention to the honey bee crisis and Colony Collapse Disorder. I donated my piece and it sold so I was happy! 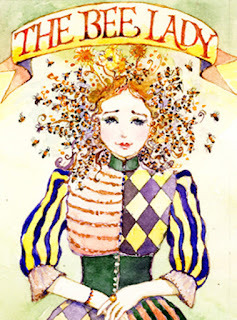 Their next show, in 2009, was the Tattered and Tangled Garden Party. The opening was in conjunction with South Pasadena's Art Walk. So much fun to stop by. 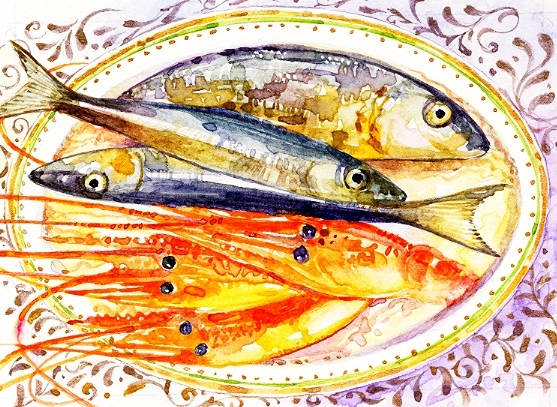 Zinnia's 2010 show was The Kitchen Show, anything kitchen inspired, whatever that meant to us artists. There were fun pieces made from kitchen utensils, cups and plates, and artwork featuring food. The Cirque de Bizarre show in 2010 was Zinnia's most ambitious show, meant to coincide with Halloween. The opening was on Art Walk night again and what a great turnout they had - artists, art lovers and friends. I'm going to miss Zinnia and hope they will relocate soon! I met my plein air painting friends at the Lummis House on Saturday. The house was built by Charles Lummis in the late 1800s and is a Los Angeles Historic-Cultural Monument, and on the National Register. Lummis was quite an interesting character. He was working at a newspaper in Cincinnati when he was offered a job at the Los Angeles Times so he decided to walk the whole distance to California (2200 miles). His walk took almost five months and he published a book about his journey. Besides being a journalist, he was also a poet, photographer, Indian activist, librarian, historian, and established the Southwest Museum here. Lummis built his remarkable home out of arroyo stones, and named it El Alisal for the California Sycamore trees that surround it. When I was first at the house years ago there wasn't even a fence around it. Now it is fenced, is a museum, and has abbreviated hours. It's such a distinctive looking structure, all stone, surrounded by a natural landscape of native plants and the sycamore trees. There were a lot of interesting views to paint of the house. It has some distinguishing characteristics like the circular tower which I wanted to include. As I anticipated painting this stone house I was concerned about how to paint small boulders and not have them look "cut out". Sycamore trees are also a challenge with their light colored trunks and mottled bark. It was a lovely day to paint under those trees. I'll post my painting and couple views of the house. The Thursday plein air painting group met in the "old town" section of South Pasadena last week. This is the city where I live. I painted here in May and wrote about it in my second post titled Plein Air Painting. For many years I've seen artists painting around town since there are some good views to paint here. But I didn't know what groups they were. I didn't know about any paint-outs. I was out of the loop! 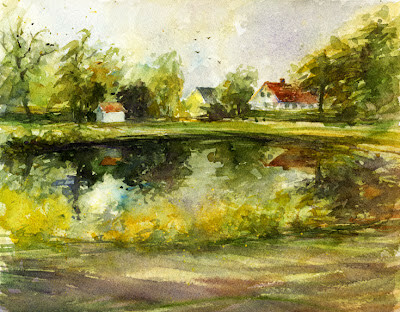 So, finally, what a thrill it is to actually be one of the plein air painters! I spent too long trying to decide what to paint and ended up choosing the building which is next to the one I painted in May. It's officially named The Century House, built in 1888 and moved to its present location to save it from destruction. It is also known as Halloween House since two of the "Halloween" horror movies were shot there. Here is my painting, my photo of the view, and a shot of some of my painting friends at work. It was wonderful to join the group for painting. I've wanted to for so long. 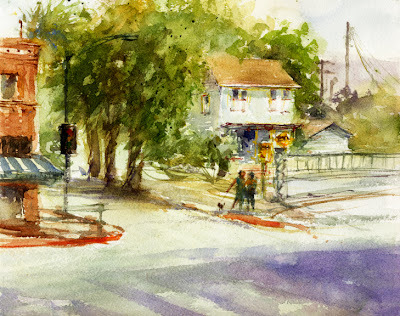 I'm lucky to live near the National Watercolor Society headquarters in San Pedro, CA. Their headquarters is in a wonderful building which is taken up mostly by a large gallery. There is a spacious back room and patio where they feature prominent watercolor artists teaching workshops and giving demonstrations. In conjunction with the 2012 Annual Exhibition they offered three demonstrations. I signed up for two of them given by Thomas Schaller and Frank Eber. They are two of my favorite watercolor artists. What a great opportunity to watch them paint, and answer questions. And, they also bring in paintings that I've only seen online. It's enlightening to see the pieces in person. Thomas Schaller also demonstrated last year and I enjoyed it so much that I wanted to see him again. I have to share a photo I took of Tom while he was painting. I think it's very exciting to watch him paint. With his background of years of painting detailed architectural watercolors, his brush handling is amazing. Just a flick of the brush. Tom also has a great sense of humor and offers many painting tips. He painted on a full sheet of watercolor paper, 22" x 30" taped to a wood board, so he didn't hold the painting up very much and I didn't get a good photo, but here he is. Today was the demo given by Frank Eber. Besides painting amazing watercolors, Frank is such a generous and fun person. It was really a treat to watch him paint and see how he goes about getting his gorgeous effects. All of our questions answered as well. Frank painted two pieces, an involved harbor scene, and later a quick lesson on earth and sky. It helps me so much to see the way Frank proceeds and plans his watercolors. It was invaluable to see him painting water, skies and clouds. Now to put all my new knowledge into my own artwork! The Virtual Paintout - Zealand! 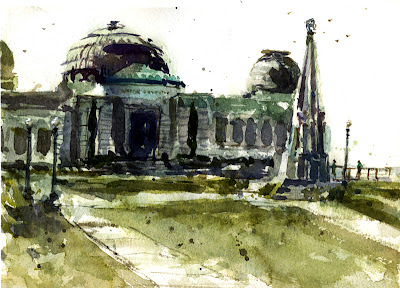 The Virtual Paintout for September was in Zealand! Not New Zealand, but Zealand. It is the largest island of Denmark. The capital of Denmark, Copenhagen, is partially located on Zealand. The Virtual Paintout was created by and is hosted by Bill Guffey. I wrote about my first try at it in my post, "The Virtual Paintout". 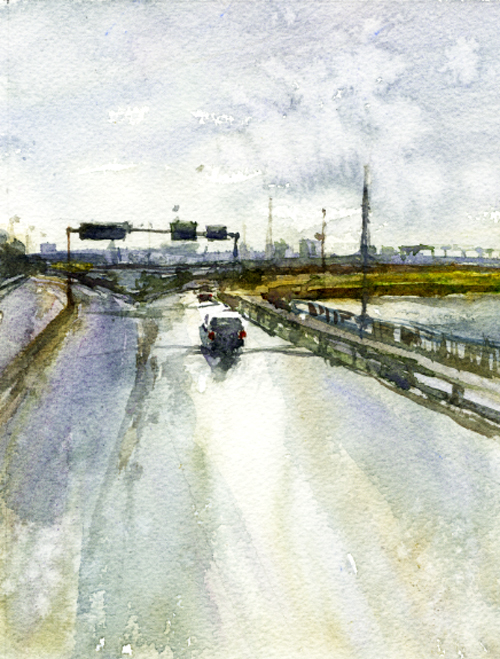 To participate in the Virtual Paintout, artists must find their reference to paint or draw by using Google Street View. The idea is to walk around the pre-determined area, chosen by Bill, as if you were participating in a real life paintout. Previous locations have been all over the world. To me Zealand was overwhelming in the variety of painting opportunities. From cities, buildings and crowds, to miles of farms and quaint homes, to beach and harbor views. It's so much fun to use Google Street View to virtually see places I'll never be in person. I always have to finally stop browsing and settle on a view or two in order to get my painting submitted before the end of the month. Here are the two views I chose for the paintout in Zealand. For the first I felt like trying to paint some water again, and for the second piece I wanted to try a very neutral watercolor. The Saturday paint-out was in Highland Park at the old police station. It is the oldest surviving police station in Los Angeles. It opened in 1926 and now operates as the Los Angeles Police Museum. It's listed on the National Register of Historic Places. I didn't paint it. 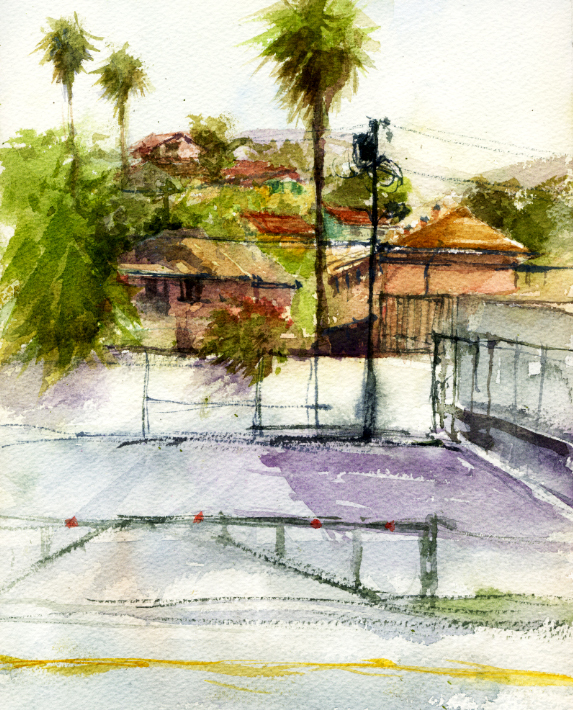 As I walked up to look at our location for plein air painting, a neat view of the hills and homes across the police station parking lot caught my eye. That view stuck in my mind and won out over the square-ish police station building. 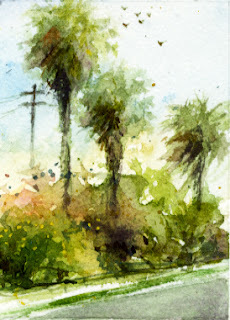 While I waited for my first wash to dry, I wanted to try a small plein air scene, ACEO size (2.5"x3.5"). I chose to paint the palms and plantings on the far side of the police building for the small piece. Along with my paintings, I'm posting a photo of the building I passed up painting. Maybe next time. There are many other exciting views to paint in Highland Park as well. Can't wait to try some others!